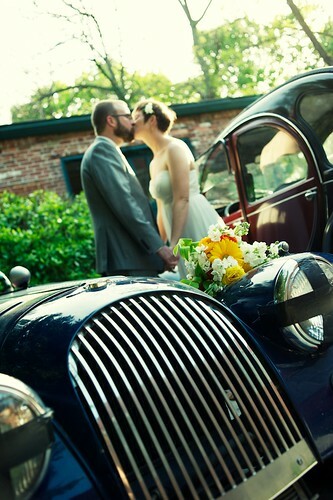 I loved everything about Andrea and Lawrence’s Hampden wedding. The couple was married at the end of April at the Elm. This unique venue is perfect for small and medium sized event in Baltimore. It has both indoor and outdoor space and feels perfect for a Baltimore couple. Andrea looked just beautiful on her wedding day! 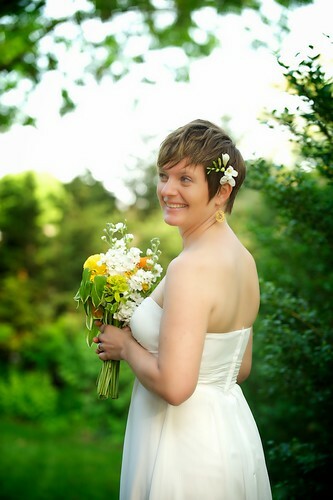 She carried a bouquet filled with Solomon's seal, stock, ranunculus, anemones and Gerber daisies. She also wore a fragrant, white freesia in her hair. Andrea’s flowers were some of my favorites of the season. 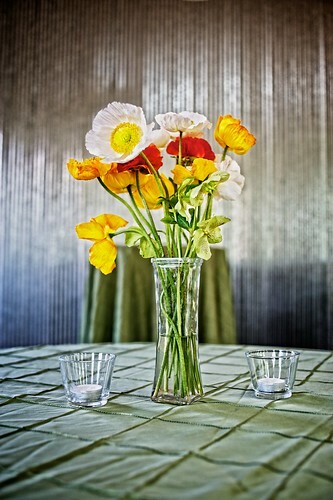 Wollam Garden’s poppies took center stage in the simple yet striking small arrangements. 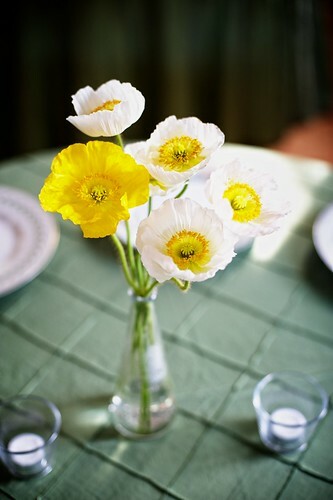 When flowers are naturally this beautiful, you don’t need many to make an impact! Andrea and Lawrence had Common Ground- my fave Baltimore coffee shop/cafe- cater the wedding! They also chose an amazing photographer! Thanks to RaRah Photo for these stunning pictures. Thanks to Wollam Gardens, Farmhouse Flowers and Plant Masters for these beautiful spring flowers! to see more photos from Andrea and Lawrence’s wedding, check out our flickr site! Special thanks to Andrea and Lawrence for choosing Local Color Flowers! Having our studio in Hampden is a lot of fun and we especially love being a part of truly local celebrations! Wishing you both much happiness in the future! We started the “You Deserve a Bouquet Today” contest to share locally grown flowers with people who really deserve them. Beth seemed surprised and very happy to receive her flowers yesterday. The bouquet was filled with lilies, calla lilies, hydrangeas, rose hip and zinnias! It was a great summer bouquet for truly deserving woman! Congratulations Beth! Do you know someone that deserves flowers? Nominate them to win August’s “You Deserve a A Bouquet Today” contest! A few weeks ago, I met with Mother Lori Babcock, Rector of St John’s Episcopal Church in Mount Washington to talk about flowers for the alter at the Church. Mother Lori was excited about the possibility of using locally grown, seasonal flowers for the alter as a way to bring a bit of nature inside the church. She also told me of the church’s desire to be more energy efficient and support small, local businesses. Finally, she explained that the beautiful sunflowers out front were a way to connect to a small farming village in Africa that some of her parishioners travel to each year to volunteer. I left the meeting excited to share my first arrangements with the congregation. They sounded like a great congregation that cared about their community and the environment. The alter at St. John’s has beautiful dark wood that would overpower anything in dark colors. I wanted to use bright, summer colors that would shine in front of the dark wood. I chose limelight hydrangeas, yellowish/green gladiolas, deep brown millet, beautiful cream and pink lilies, fuchsia celosia and zinnias and a few creamy/purple calla lilies from this weekends wedding. Thanks to our growers! The calla lilies came from Plant Masters this week while the other flowers came from Locust Point Flowers. Hope everyone enjoyed them this morning! 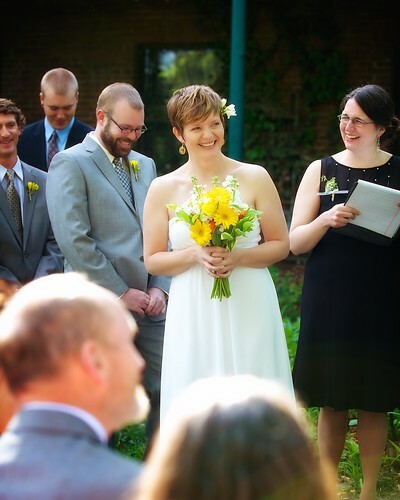 Gillian and Aaron were married on Memorial Day weekend in Leesburg, Virginia. I loved the color scheme Gillian had chosen: dark blues, dark purples and deep, dark pinks. I ALWAYS steer people away from blue because there are so few “true blue’ flowers available and their timing is always a gamble. Gillian was flexible and said if they were available, we should use them. Sure enough, the color scheme was perfect for the end of May this year. The bride carried a bouquet filled with unique flowers include iris’, baptisia, the most beautiful aubergine sweet peas from Lynn Vale Studios, early fuchsia dahlias, bachelor buttons, larkspur, sweet william and more! The girls carried similar bouquets which looked beautiful against their blue dresses. The groom’s boutonniere was made up of a single, blue bachelor button, a little pop of pink from the sweet william and a couple sprigs of rosemary. The chuppah was decorated with vibrant arrangements that were just the right size to add color and interest to the ceremony site but not take attention away from this beautiful couple. The reception was at the gorgeous Landsdowne Resort. The views from their ballroom terrace of the rolling hills of Virginia were amazing. Thanks to our growers for these bright beautiful flowers: Wollam Gardens, Lynn Vale Studios, Locust Point Flowers and Talmar. Thanks to Nicholas Griner and Freed Photography for these great photos. Thanks to the synagogue helpers too-they were great fun to work with! Congratulations to Gillian and Aaron! Wishing you much happiness in the years to come! Today was hot! Almost 100 degrees. But that didn’t stop 3o flower enthusiasts (farmers, gardeners, florists and more) from coming to Southern Maryland to tour four beautiful flower farms! The tour started at Ben Stolzfus’ Mechanicsville farm. Ben and his family are growing a wide variety of cut flowers including sunflowers, asters, zinnias, coxcomb and more. Ben was enthusiastic about flower growing and was excited to both share with and learn from all of the growers that had come to see his farm. Our next stop was Elvin Weaver’s beautiful farm. I first met Elvin a few years ago at a growers meeting he attended with his friend and neighbor Kathy York of Scarborough Farm. As Mennonites, Ben and Elvin manage the work of their farm with out electricity and without modern technology. Don’t think that this slows them down though. Elvin has three acres under production with cut flowers and they are just gorgeous! Leon Carrier of Plant Masters looks on as Elvin and his wife answer questions about the farm. After visiting the Weavers, we traveled a half mile down the road to the Loveville Produce Auction. The Loveville Produce Auction was like nothing I had ever seen before. Farmers pull their mostly horse-drawn, flat bed trucks into the open air auction center where bidders are waiting to bid on truck loads of local produce. From thousands of pounds of melons to flats of locally grown cut flower bouquets, there is something here for everyone. After the Auction, we headed to Sutter Post Farm, owned by Judy and John Mast. Sutter Post Farm was…incredible. Row upon row of beautiful flowers as far as the eye can see. The coxcomb and zinnias seemed to go on forever! Our last stop on the tour was Scarborough Farm owned by my dear friend Kathy York. Years ago, when we were contemplating starting LoCoFlo, Marina and I visited Kathy at her home. We toured her farm, envied her studio, and were inspired by her designs and creativity. It was great visiting her again. It always feels hard to get away for a whole day during wedding season. There is always so much to do. I’m so glad I made time today to spend time visiting, touring and learning from the host farmers. I also had a great time catching up with many of our current growers include the Carriers from Plant Masters, Dave from Farmhouse Flowers, Pam and Jen Pahl from Pahl’s Farm, Rick from Seaberry Farm and Beth from Belvedere Farm. To see some more photos from today’s tour, check out our flickr site.